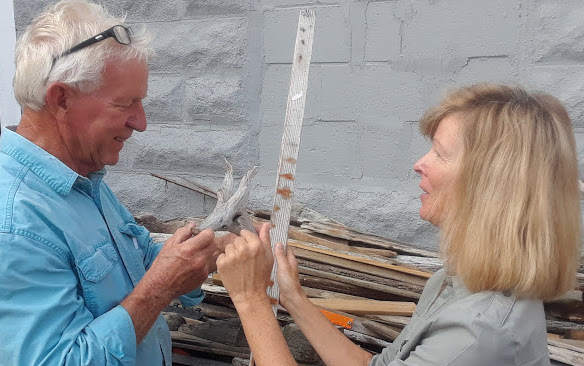 BOSTON - Aug. 29, 2018 - PRLog -- When interior designer, Maureen Reddy, got the call to stage a revamped Victorian near the shores of Winthrop, MA, she knew immediately that she would use the unique driftwood collages of local artist, Richard Honan, to enhance the property. For over 15 years, Honan and legions of volunteers have stocked and sent tons (literally, over 18 tons) of care packages to our troops around the world. These precious packages put smiles on the faces of our bravest men and women and are filled with food, clothes, supplies…and most of all …love. Reddy's creative design process resulted in a win-win situation, where the property was adorned with unique and sophisticated art, the sellers were ecstatic with the staging results, and our troops benefited from the alliance of two artist. This surely was "Home Staging with Heart".